Turkish tech site Donanim Haber received leaked slides that reveal AMD is getting ready to launch the FX-6200, a new six-core chip with a 3.8GHz clockspeed and 4.10GHz Turbo. It features six cores, 6 MB total L2 cache, and 8 MB total L3 cache. Its TDP is rated at 125W. 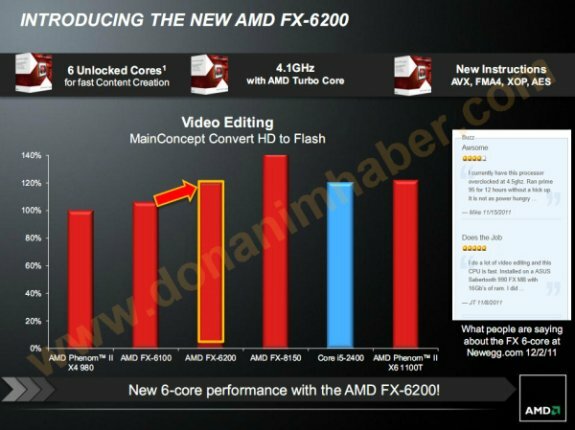 In a presentation to retailers sourced by DonanimHaber, AMD pitched the FX-6200 to have about 10% higher performance at Mainconcept HD to Flash conversion, than the FX-6100 (3.30 GHz nominal, 3.90 GHz max. turbo).